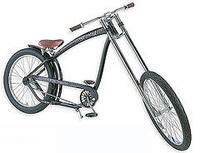 The look of Scandinavian Eightball Bikes was inspired by US planes of the 1940s. STW2D tells us that they have a hi-ten frame in a felt tank design, fender eyelets, a rollerbrake in the front and a back pedal brake and a black coated aluminium Alexrims. Of course, I'm not recommending exercise here - but if you were impartial to a little dashing about, you could try riding one of these Stussy bikes by Nirve.